FACT CHECK: Did President Donald Trump Donate His Entire $400,000 Salary to Rebuild Military Cemeteries? Prominent conservative commentators boosted a false, mathematically impossible rumor about the president's salary donations, taking aim at the news media along the way. In the summer of 2018, President Donald Trump donated his entire $400,000 annual salary to the Department of the Interior for the purpose of rebuilding military cemeteries. During his 2016 presidential campaign, Republican candidate Donald Trump, a billionaire real estate developer, vowed that if elected he would forgo the $400,000 annual presidential salary. So far as president Trump has stuck to that promise, handing over checks every three months for various projects overseen by different government departments. As the Washington Post has pointed out, some of the initiatives President Trump donated to were at uncertain stages of development or did not yet exist at the time he made his contribution, which prompted some additional scrutiny, but President Trump has nonetheless stayed true to his word and handed over a check representing his presidential salary every three months. Trump continued this tradition in 2018, donating his first-quarter salary to the Department of Veterans Affairs, a sum which then-Acting VA Secretary Robert Wilkie said had been earmarked for “caregiver support in the form of mental health and peer support programs, financial aid, education training, and research.” The president donated another quarter’s salary to the U.S. Small Business Administration for the purpose of establishing an “Emerging Leaders” program focused “on helping veterans start small businesses after military life.” And the third quarter of his 2018 salary went to the National Institute on Alcohol Abuse and Alcoholism, according to the Associated Press. On 18 March 2019, President Trump announced on Twitter he was donating a quarter of his salary to the Department of Homeland Security. White House sent their spending report to Congress. This was in it: “Instead of taking his salary, Trump donated all $400,000 to the Department of the Interior where it will be used for construction and repair needs at military cemeteries!” Media gave this no coverage. 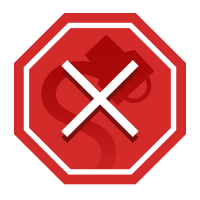 These social media posts were accompanied by articles published by various right-wing web sites including the Gateway Pundit, the Right Scoop, and the viral content web site Social News Daily. There were two immediate problems with this set of claims. First, President Trump could not possibly donate his entire $400,000 annual salary for 2018 for the purpose of rebuilding military cemeteries, because he has already donated the first quarter’s worth of that salary to the Department of Veterans Affairs for an entirely separate initiative. So he only had three-quarters of his salary left to distribute, a mathematical fact that undermines the credibility of these claims. Second, the social media posts and articles making this claim were very thinly sourced, to say the least. Neither the viral Facebook post nor meme that we highlighted above cited any source, and the three news articles we mentioned all relied on the two tweets from Charlie Kirk and Mark Simone. Simone did not include a link to that report in his tweet, and neither he nor Kirk responded to our requests for clarification or documentation. The White House did send a somewhat related report to Congress a month before these claims emerged online. The White House Office’s Annual Report to Congress on White House Personnel lists the names, titles and salaries of White House employees, and the 2018 report, published on 29 June, made no mention of President Trump’s salary, nor his donations from that salary. … It’s what the report said Trump did with this salary that has everyone talking! Instead of taking his salary, Trump donated all $400,000 to the Department of the Interior where it will be used for construction and repair needs at military cemeteries! AMAZING! It’s so great to have a President who loves our brave military men and women so much! Oh, and where’s the media coverage of this? Oh that’s right, they don’t cover anything good that the President does. However, the claim was as false in 2017 as it was in 2018. As we outlined at the beginning of this article, President Trump distributed his 2017 salary in four separate chunks, to four separate projects, none of which involved military cemeteries. The White House had already announced two of those donations by 26 July 2017, so the viral rumor was demonstrably false even as it first emerged online, twelve months before Mark Simone and Charlie Kirk’s viral tweets. 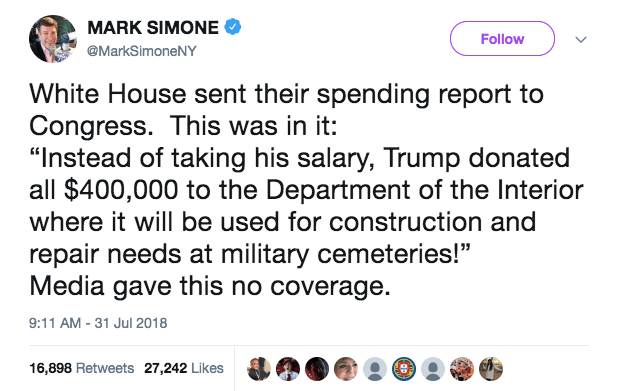 The 2017 rumor, which was the source of Simone’s tweet, claimed that the 2017 White House Office Personnel report had described President Trump’s intention to donate his whole salary for repairs on military cemeteries. That official report, which can be viewed here, did not mention the president’s salary, his donations from that salary, nor cemeteries of any kind. The president did donate his first-quarter 2017 salary to the Department of the Interior, but not for the reconstruction of military cemeteries. This inaccuracy was then compounded in the subsequent online rumor, which took Forbes’ accurate description of the donation as being “in the first quarter,” and simply replaced it with “all $400,000” (i.e., the entire yearly salary). According to a Department of the Interior press release, President Trump’s $78,333 donation formed part of a larger $263,545 fund which was used by the National Park Service to make repairs at Antietam National Battlefield in Maryland, site of the Civil War Battle of Antietam (or the Battle of Sharpsburg, as it was commonly known in the South). The donation will restore the historic Newcomer House on the Antietam battlefield, and will underwrite the replacement of 5,000 linear feet of deteriorated rail fencing along the Hagerstown Turnpike where some of the most intense fighting of the battle occurred. There is a cemetery at Antietam National Battlefield, but President Trump’s donation had nothing to do with it. 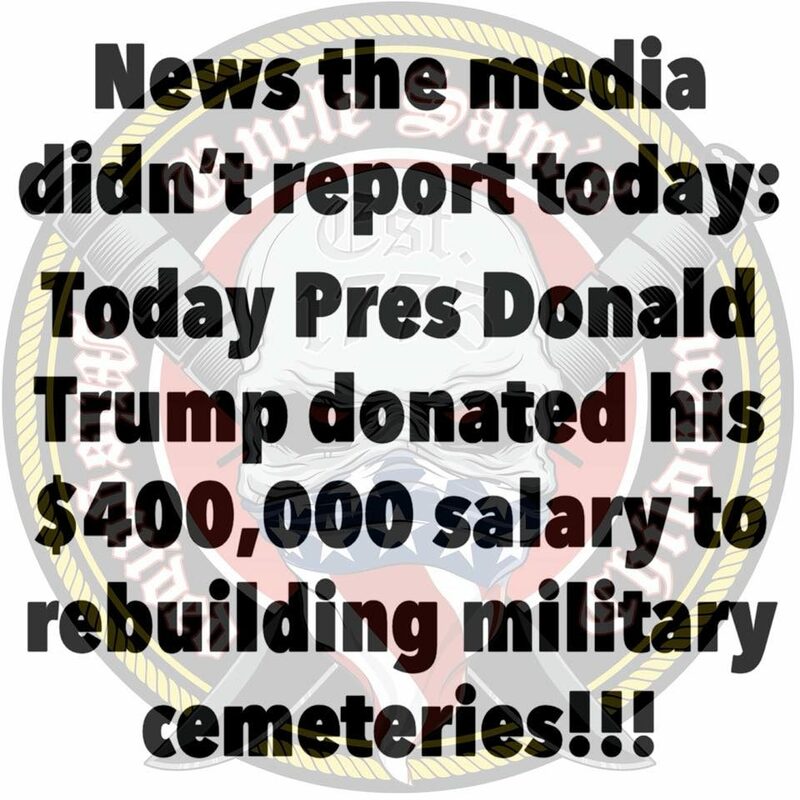 The claim that President Donald Trump decided either in 2017 or 2018 to donate his entire $400,000 salary to the reconstruction of military cemeteries, and that a blinkered, biased news media refused to report this, is false. Each of President Trump’s actual salary donations (executed in quarterly disbursements, not once a year) has been reported by major news media, including some of the nation’s biggest and most widely-read news outlets. The news media has not reported on the president’s donation of his entire $400,000 annual salary for the reconstruction of military cemeteries due to the plainest reason of all: because it hasn’t happened. The Washington Post. 13 February 2018. The Washington Post. 6 March 2018. The Gateway Pundit. 1 August 2018. Social News Daily. 1 August 2018.